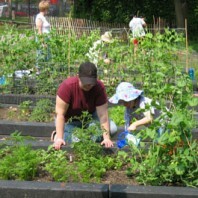 Community gardens are 90 percent community and 10 percent garden. Topics to be covered include: Building the community that will build the garden; locating a site, Insurance, Fundraising, Rallying community resources for planning and gardening, designing and installing the garden and managing the garden. Pat Munts has ten years of experience building the community garden system in Spokane. Who should attend: members of churches, neighborhoods, schools, retirement communities, low income housing communities, college groups, social service agencies and neighborhood groups. Class is under the Personal Enrichment category, under the Environmental Science’s section at Community Colleges of Spokane. Persons with disabilities who require alternative means for communication or program information or reasonable accommodation need to contact Spokane County Extension at 222 N Havana Spokane WA 99202; (509) 477-2160 at least two weeks prior to the beginning this educational series.